Visitors to the Ardennes American Cemetery naturally expect that all the servicemen interred there are American. But that may be untrue. One particular grave may hold a German soldier. Morris and his team opened the grave and found a wooden box containing one or two pounds of charred bone fragments, strands of brown hair, and a small tin holding two American dog tags. There were also vestiges of clothing, remnants of GI shoes, aircraft parts, and bits of a Mae West life vest. All showed fire damage. The embossing on the tags identified them to John R. McLeod, serial number 36824575. The team believed they had recovered McLeod. They also learned that a Belgian Army sergeant named Thommes had buried the remains at the cemetery in September 1945 and had placed the tags in the tin. Thommes belonged to a unit stationed in Ligneuville and had helped with clean-up efforts in the Belgian city of Saint Vith. 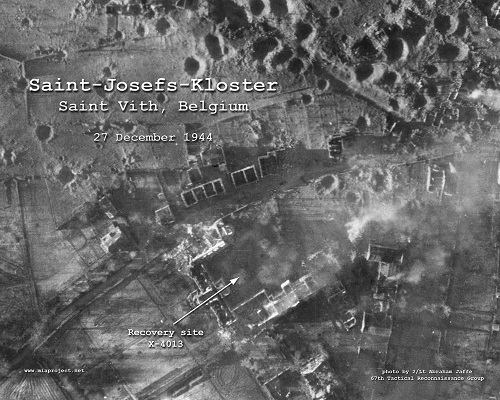 Aerial of the Belgian town of StVith after the bombardment. Photo by 2/Lt Abraham Jaffe, Bronx, New York. landscape than a town where 2,800 people once lived. Thommes discovered the bones and artifacts in the courtyard of the Saint Josef Convent, a city landmark which lay in ruins. He located the items near a single tree that had somehow survived the apocalypse that obliterated the convent and the surrounding community. The worst destruction occurred on December 25 and December 26, 1944. Over those two days, the Royal Air Force and U.S. Army Air Force pummeled Saint Vith with over 1,000 tons of high explosives. Thommes transported the remains a few kilometers north to the Nieder-Emmels cemetery. He presumed McLeod was an American prisoner killed during the aerial blitz or perhaps a GI who perished during the German artillery bombardment that preceded the city’s capture by Wehrmacht troops on December 21. Thommes could only guess as to how the soldier met his demise. McLeod proved an even bigger puzzle to the staff at the American military cemetery. They had no record of anyone by that name who died during the war. 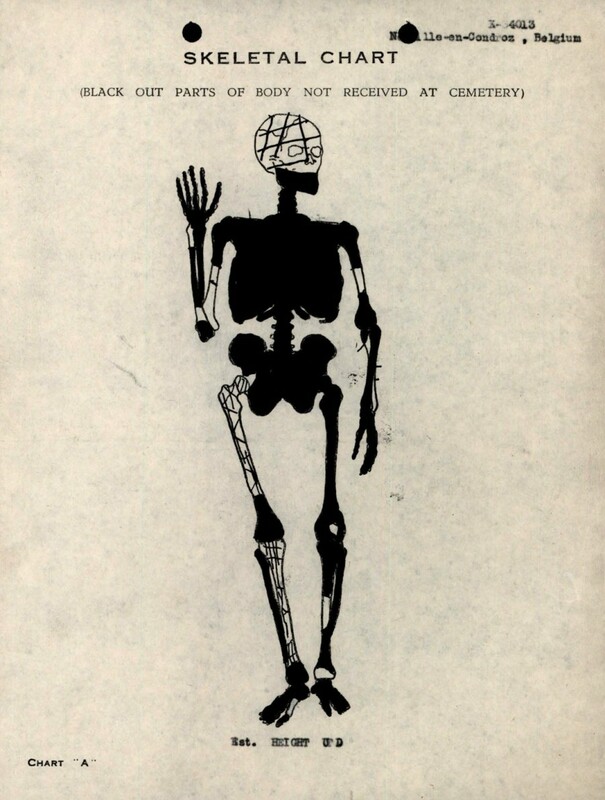 The cemetery workers therefore interred the remains as Unknown X-4013. They speculated that he belonged to the Army Air Force. In 1949 the Memorial Division in Washington determined that McLeod survived the war and resided in St. Charles, Illinois. 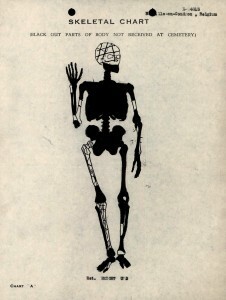 He soon received a letter asking for his assistance in unraveling the mystery. The young veteran had served with Company B, 393rd Infantry, 99th Division. No record exists to explain what happened afterward. Today X-4013 rests among the U.S. dead at the Ardennes American Cemetery: Plot A, Row 17, Grave 3.